In 1991, Adrian Tomine self-published the first issue of Optic Nerve. Consisting of three xeroxed sheets of paper, and with a print run of twenty-five, it was a less-than-auspicious, largely unnoticed debut. 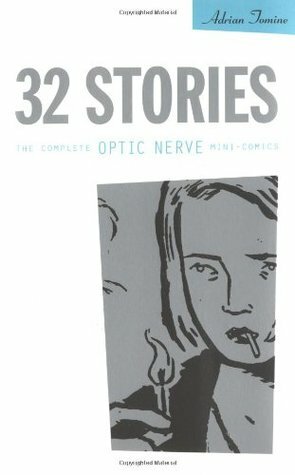 In the following three years, though, Optic Nerve developed at a startlingly rapid pace: the artwork and writing evolved with each story, production quality improved, In 1991, Adrian Tomine self-published the first issue of Optic Nerve. Consisting of three xeroxed sheets of paper, and with a print run of twenty-five, it was a less-than-auspicious, largely unnoticed debut. In the following three years, though, Optic Nerve developed at a startlingly rapid pace: the artwork and writing evolved with each story, production quality improved, page counts increased, and by issue seven, sales had reached 6,000. In 1994, Drawn & Quarterly took over the publishing duties of Optic Nerve, and the original seven issues sold out and were left out of print. 32 stories presents these rare, early editions, collected for the first time in a single volume.